A well-presented and exceedingly light first floor apartment enjoying exceptional and uninterrupted views over Budleigh Saltertons beach, the whole of Lyme Bay and along the coastline to Berry Head. Quite simply this spacious and bright property is a unique opportunity, situated on one of the most desirable stretches of coastline throughout the UK. Otterbourne Court is a highly sought after development which is maintained to a very high standard. The building is pleasantly elevated, boasting a southerly aspect with beautifully kept communal gardens. Located just a few hundred yards from the beach, Otterbourne Court also provides easy access to the town and all its amenities. The local games clubs are in close proximity, as is the nearby attractive footpath that runs along the old railway line, providing a convenient approach to White Bridge and excellent walking along the beautiful River Otter. Communications are excellent with local bus routes being in the near vicinity. 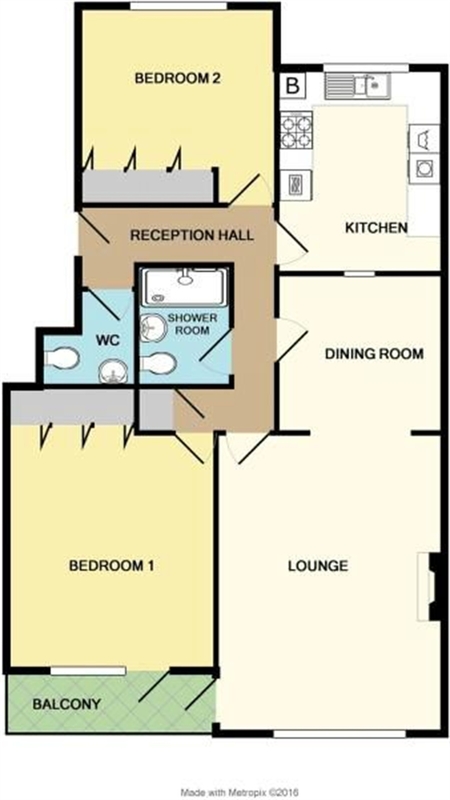 The flat is held on a lease (125 years from 1st June 2006) from The Management Company but no ground rent is payable as the Freehold is owned by The Management Company in which each flat owner has a share. The cost of maintaining and insuring Otterbourne Court are shared between the residents. We understand the current charge is approx. £2000 per annum includes the cleaning of the communal parts, maintenance of the lift, communal lighting and building insurance. It also includes maintenance of the building and the grounds. The maintenance charge is paid half yearly. Drew Pearce of Exeter are the managing agents. Neither pets nor holiday lets are permitted in Otterbourne Court. Head from the High Street of Budleigh Salterton down towards the sea and Marine Parade. Continue up the hill and around the sharp bend at the top, this brings you into Coastguard Road where Otterbourne Court can be found on the left hand side. Stairs to first floor landing with cupboard housing meters, dustbin and water stopcock. Private front door with spyhole leading to Reception Hall. Coved ceiling; entry phone; telephone point; central heating programmer; linen cupboard with tubular heater; two power points. uPVC framed double glazed window; three wall lights; mock fireplaceand marble insert hearth; double central heating radiator; coved ceiling; television socket; telephone point; double and one single power points; uPVC framed double glazed door to the Balcony. With low level w.c.; wash hand basin with strip light and shaver point above; central heating radiator. Enjoying superb Southerly views over Lyme Bay. Non slip tiling; light. Having a double sized shower (originally bath); pedestal wash hand basin; low level w.c.; radiator/towel rail; coved ceiling; two good sized mirrors; strip light and shaver point; half height tiling and full height around shower. Double central heating radiator; range of recessed wardrobe and shelved cupboards; telephone point; three power points; coved ceiling; uPVC framed double glazed sliding patio doors to the Balcony giving superb Southerly views over Lyme Bay. Central heating radiator; built-in range of wardrobe and shelved cupboards; three single power points; uPVC framed double glazed window; coved ceiling. To the rear there are communal, landscaped gardens that are maintained to a very high standard. Laid mainly to lawn with a shrub border the gardens offer superb panoramic views of both Lyme Bay and the town. There is also a path, Madeira Walk, which acts as a shortcut to the town and the beach. All Main Services are connected. Council Tax Band F. Allocated GARAGE 15' 7" (4.75m) x 8' 9" (2.67m) with up and over door. Visitor Parking Area.